People are reminded to improve home safety by registering their fridges, freezers, washing machines and tumble dryers. Registering is completely free of charge and it means that manufactures can quickly contact owners to notify them of any issues and faults can be repaired as quickly as possible. The reminder from Cleveland Fire Brigade comes in support of National Register My Appliance Day (Thursday 24 January) organised by the Association of Manufacturers of Domestic Appliances (AMDEA). This is a safety initiative designed by AMDEA to make it quicker and easier to register over sixty leading brands of appliances directly with the manufacturer. The majority of brands offer registration of products up to at least twelve years old, so some second-hand goods as well as new goods can be registered. 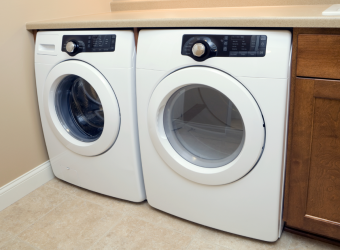 Figures show that less than a third of these large white goods were registered when they were purchased. Steve Johnson, Area Manager, Prevention and Protection, said: “These are appliances we rely on every day and it is essential they are kept in proper working older to minimise the risks of fires caused by electrical faults. “We know that appliances are kept for many years but very few people realise that they can register older models. These are the products that are most difficult to trace if a safety repair is ever needed .We would encourage to sign-up immediately”. Manufacturers may identify problems with a model once the product has been in use for some time. They then need to contact owners to get the fault corrected as quickly as possible. Normally a quick in-home fix by a qualified technician will remove any risk.